Those low carb Fudgy Avocado Brownies are the best sugar-free brownie recipe you’ll ever made. It has a delicious fudgy texture, strong chocolate flavor and crunchy pecan nuts. You’ll love that those avocado brownies are a one-bowl blender recipe ready in few minutes. A quick and easy healthy treat for low carb and gluten free brownies lover. I am such a chocolate lover! There is not a week in my house without a chocolate treat. And if you follow me for a while you know how much I adore low carb recipes specially sugar free dessert recipes. But I must say, those Fudgy Avocado Brownies are one of the most surprising sugar free chocolate recipe I ever made. I love using avocado in many recipes but it is the first time I am using it in baking as a butter substitute. It provides an incredible fudgy texture to brownies, no aftertaste at all and help us reach our 5-a-day while enjoying brownies. Yeah! Look at this delicious chocolate batter ! Yum. Of course, you must use very ripe avocado to avoid lumps and obtain the texture above. If your avocado don’t ripe very well store them near bananas at room temperature for few days. The ethylene that bananas release will ripe the avocado faster. 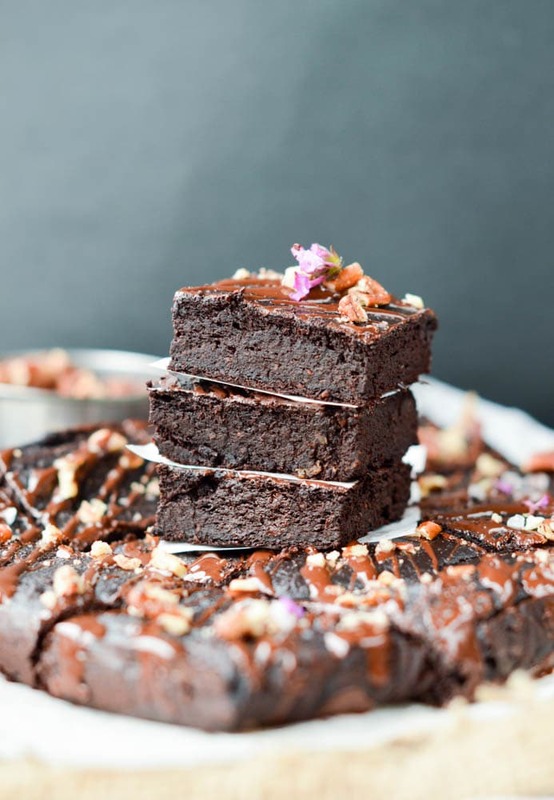 You will quickly end up with nice ripe avocado to make this Fudgy Avocado Brownies recipe. I used a combo of almond flour and natural sweetener – erythritol – to create those beautiful low carb avocado brownies. After all the yummy food we indulged on during the holidays it is probably better to cut down the carbs. If you don’t like stevia – I used a brand that combine stevia and erythritol – and you don’t watch the carbs too much simply replace the amount of erythritol by the same amount of coconut sugar in the recipe. It will raise the carbs in the recipe and the recipe will not be sugar free anymore, of course! But it is an option for clean eating foodies that prefer natural sweetener to stevia. I hope you’ll enjoy this recipe I wrote and made for you before leaving on maternity leave. You can still write me comments ! I will do my best to reply each weeks while taking care of my newborn. It is summer here and I won’t probably indulge too much on brownie after having my baby. But I know I will crave chocolate and sweet with the lack of sleep so I fill up my freezer with healthy chocolate chia Popsicle instead and make ahead some baking mix of my 2 minutes low carb chocolate mug cake ! Those brownies made of avocado are low carb Fudgy Avocado brownies with only 3.5 g net carb per slice, sugar free, gluten free and healthy fat. 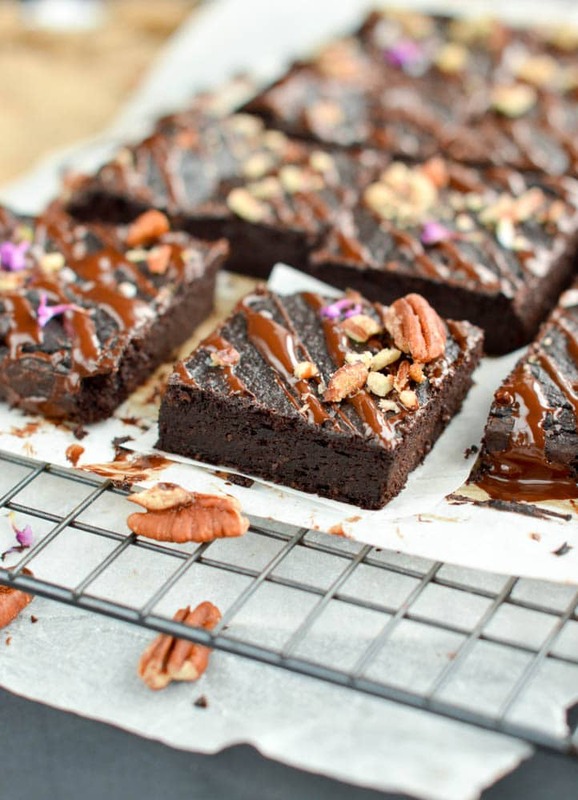 Those delicious healthy avocado brownies are for all the chocolate lover who can't eat sugar. Preheat oven to fan-forced 180 C (350F). Line a square brownie pan (24 cm x 24cm) with parchment paper. Set aside. In a small saucepan add the dark chocolate bites and coconut oil. Bring to medium heat until fully melted. You can also place both ingredients into a bowl and microwave on high by 30 seconds burst until fully melted. Set aside. Process for 30 seconds to 1 minute or until all the ingredients comes together and you obtain a thick brownie batter. Transfer the batter into the prepared square pan. Spread the batter evenly in the pan using a spatula. 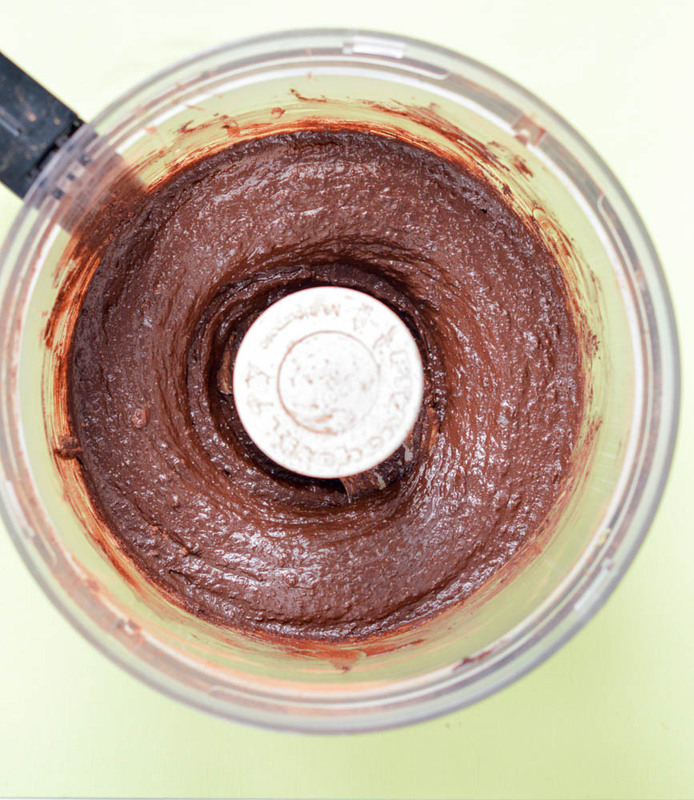 Bake for 25-30 minutes or until a skewer inserted in the middle of the brownie comes out clean. Cool down 10 minutes in the pan before pulling out the brownie from the pan using the parchment paper to pull out the brownie easily. Transfer the brownie on a cookie rack to cool down until room temperature. Meanwhile prepare the chocolate glazing and toppings. In a small saucepan, under medium heat, melt the sugar free chocolate bites with coconut oil until fully liquid and shiny. Stir often to avoid the chocolate to burn. Use a teaspoon to drizzle the melted chocolate on top of the brownie and decorate with crushed pecan nuts and sea salt - optional. Cut the brownie in 16 squares and store the brownies in the pantry in an airtight container for up to 4 days. Sugar free sweetener: if your erythritol brand doesn't dissolve well you can pre-dissolve the sweetener with 4 tablespoon of boiling water before adding into the food processor. Sweetener replacement - not sugar free: you can replace the erythritol by the same amount of unrefined sugar like coconut sugar or muscavado sugar. 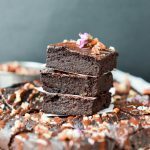 This will raise the carbs of this recipe but if you can eat sugar it will makes healthy and delicious fudgy avocado brownies as well. OMG ? these are amazing !!! Thank you SO much !!! This is worth every single carb and more my goodness it’s to die for , Really!! Hi Lisa! I totally agree! 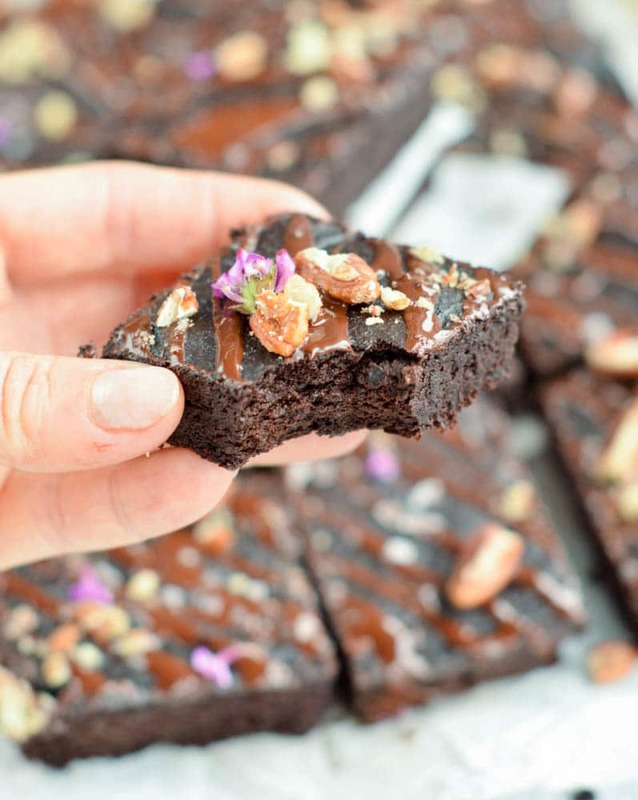 this brownie is BOMB and it won’t blow your daily carbs! I love it and I really plan to make this again for Valentine’s day this tomorrow. Enjoy the recipe on the blog, I have got plenty of low carb recipes if you love them ! See you soon on the blog and thanks for your lovely comment! Carine. Hello! I am so happy you love this avocado brownie. As you said, even if you are not a big avocado fan this recipe is super tasty. My 4 years old would never eat avocado but she loves that brownie recipe! I hope you will find more delicious dessert and meals on the blog too ! See you soon around the blog Sylvia. xoxo. Carine. I haven’t made them yet! 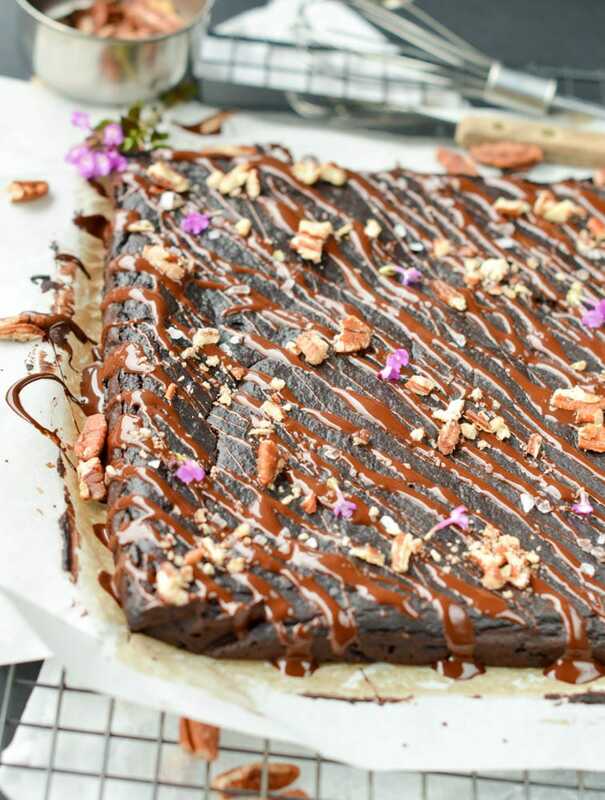 I’m a sweets fanatic, I’m so glad to know they have low carb brownies and I can’t wait to make them! I would love more recipes. Taste rich and delicious. Do you know the fat count per brownie? Amazing! I am glad you like them. The full nutrition panel is provided after the recipe card (scroll down) and you will see all the details about carbs, fat calorie per serve. Enjoy the blog and the recipes! XOXO Carine. Can these be frozen after baking? Yes sure !Let them cool down and store in zip plastic bags and freeze. Defrost an hour before eating. Enjoy. XOXO Carine. Is the topping included in the nutritional analysis? What is Healtheries sugar free dark chocolate bites? Chocolate Chips? I can’t find them on any sites in the US. Hi Megan, Healtheries is the brand of sugar free chocolate sold in my country in New Zealand. You can use any brand of sugar free dark chocolate bites in your country or even any dark chocolate>70% cocoa. The more cocoa the less carbs and sugar you will add to the recipe. I enjoy sugar free stevia chocolate because it does not add sugar or carbs to my brownie recipe. In USA you can try this sugar free chocolate brand HERE. Enjoy the recipe ! Carine. Hi! I think, for us US folks, maybe “unsweetened” would make more sense than “sugar free”. What we call sugar free here is the chocolate that has artificial sweetener /stevia/etc in it. On that note, I’m heading to the store shortly and buying what I need to make this but am going to have to hide the avacado because nobody likes them but me. 😀 Thank you!! Hi Marla, thank you so much for this important info! I live in NZ wand wording are a bit different I guess. I updated the recipe! I hope you enjoy this brownie recipe. My little girl don’t like avocado either and she is eating this brownie like crazy 🙂 It is the best recipe I ever made to hide avocado and make all the family eat it ! Enjoy! See you soon on the blog. xoxo Carine. can the Lily’s sugar free dark chocolate chips be used in place of the chocolate bites in this recipe and still give a “fudgy” result? Hi, Sure! any chocolate chips will work well, the fudgy texture is mainly coming from the avocado ! That is the magic ingredient. Enjoy the recipe. xoxo Carine. what is the carb 17 Grams or 1.7 ? Thanks! Hi Lisa, this brownie recipe makes 16 slices. Each slice contains only 3.7 grams of carbs mainly fibre 1.5g ! So it is a very low carb brownie recipe safe if you are on a low carb diet or keto diet 🙂 Enjoy the chocolate treat! Carine. Is almond meal the same thing as almond flour? Sure almond meal and almond flour are the same ingredient! Enjoy the recipe it is delicious ! xoxo Carine. I thought almond meal and almond flour were a little different. I really want to make these but i want to make sure i use the right one. Hi Robyn, yes almond meal and almond flour are the same thing! enjoy the recipe. xoxo Carine. Would you possibly know the 21 day fix container counts on this? Hi Elaine, I am very sorry but I can’t provide an accurate answer as I am not following a diet and I am not aware of the 21 day fix one! I hope you will figure out something using calculation tools on google … So sorry for that. It is a wonderful brownie recipe and I am sure you’ll love it! Thanks for your comment and good luck with the diet Elaine. See you soon on the blog. xoxo, Carine. Hi Mel, I will not sub almond meal by coconut flour in this brownie recipe. Coconut flour contains 40% fibre which means it is very water absorbent compared to almond meal. If you use it in this recipe the result will be very dry and not fudgy at all. If you really want to add some coconut flour in this recipe don’t substitute more than 1/4 cup. But again, the texture won’t be as fudgy as it should be! Enjoy the low carb fudgy brownie ! xoxo Carine. Do you have to use baking soda? Or was that supposed to be baking powder? You can substitute 1/2 tsp baking soda by 1 tsp of baking powder. But don’t ommit it because it really add a lighter texture to the brownie. Enjoy the recipe ! xoxo Carine. Would really help to have written the instructions in farenheight and cups, Tbsp, tsp, etc, as I made them with great difficulty after questioning each measurement. Then baked them at 180F and did not cook right! Very frustrated right now.? Hello, I am so sorry it did not come out great. However I am not sure what you mean as this recipe is converted in US measurement an European measurement. Each ingredients is listed in grams, cups and tablespoons/teaspoons. The only information I did not shared was the Fahrenheit oven temperature – we use C in New Zealand and you can easily convert that on google. However I updated the oven temperature for US followers now. 180C means 350C. I used fan forced oven as mentioned in the recipe. I really hope you will try this recipe again! It is a delicious healthy brownie recipe ! xoxo Carine. I made these and they are great! Thanks for sharing! I do not see the Nutrition Panel you reference right after the recipe. I entered this recipe in cronometer and it shows higher net carbs, so just wanted to check the nutrition info. Thanks! I am so glad you love the recipe! I love this brownie so much ! It is great to calculate the nutrition panel on your side as well – specially if you did not use the same sweetener. Thanks for trying my recipe ! I hope you will try more of my sugar free recipes on the blog. I have got plenty of other sugar free desserts here. Enjoy ! Carine. What info did you get for these (fat, carbs, protein)? Thanks! No sure what you mean Jenn The nutritional panel is provided after the recipe cards by nutrifox. The calculation is made using the ingredients I used – erythritol and 100% sugar free chocolate sweetened with stevia. I hope it helps. Enjoy the brownie, Carine. So good that I made them TWICE in one week! Hi! They are addictive right? same here each time I do those brownie we eat all in few days ! I am so glad you love this recipe as much as we do in my house. I hope you find even more delicious sugar free recipe on the blog! enjoy the blog my friend! xoxo Carine. Hey, I love the way those brownies look. I just have one question, I live in Perú so we don’t have erythritol or any of those other brands. If you use only stevia how much would you use and would it work? Hi Michelle, this recipe would’not work with stevia only. Stevia doesn’t add texture to baked goods and the brownie won’t hold together. If you don’t eat sugar free but clean recipes you can use coconut sugar, it is an healthy alternative. Use same amount as erythritol. Enjoy the recipe ! I am so happy to have readers from Peru ! I would love to visit your country one day. xoxo Carine. Can you please tell me what the fat and protein ratio is on these? Hi Jenn, to calculate a ratio of fat per protein simply divide the amount of fat in a recipe by the amount of protein. Here it will be 6.4g/2.4g = 2.6 g fat per protein. how many grams of fat and protein and carbs ? Hi, the full nutrition panel is provided after the recipe card for one slice of brownie. Enjoy ! Carine. Can you tell me if I can use Swerve as the sugar substitute and if it would be the same amount? Thanks!!! Yes, I do recommend to use swerve in this recipe. It is the best sweetener to make this low carb brownie sugar free, low carb with great taste! No bitterness at all !!! Enjoy. xoxo Carine. I made your recipe with coconut sugar instead of erythritol. I must admit this was the most DELICIOUS fudgy brownie recipe I made. Thanks for sharing! Coconut sugar is a great healthy alternative if you can eat sugar. Thanks for your lovely comment 🙂 xoxo Carine. Would unsweetened baking chocolate squares work for this recipe? Hi Amanda, Any chocolate will work in this recipe. I made this brownie many times with sugar free chocolate sweetened with stevia, 85% cocoa chocolate or even vegan dark chocolate. It always came out great! Enjoy the recipe. XOXO Carine. Thank you for another wonderful recipe. I truly appreciate how you took the time to convert all of the measurements. God bless and I wish you a wonderful holiday season. Hi! You are so kind to me. It makes me so happy to read your comment. Thanks for taking some time to add a lovely message. Have a great holiday season too and huge thanks for reading the blog and trying my recipes. xoxo Carine. Looks so delicious! Really want to make it. But I don’t have Erythritol or coconut sugar… Can I use a banana as a sweetener or will it make the totally different texture and taste? Hello! I won’t recommend to use a banana instead of the crystal sweetener – it will add moisture and the texture will be too different. What about using unrefined cane sugar ? There is plenty of healthish option like brown sugar, demerara, rapadura sugar. What can you find in your place? Let me know, I am happy to help out 🙂 Have a lovely Christmas XOXO Carine. Do you know if these can be frozen, please? Hi! I never tried to froze them but I am pretty sure it freeze well as any other brownies! Enjoy the recipe. XOXO Carine. Who knew an interesting concoction of ingredients would produce such an amazing treat? Not, I! I didn’t make the drizzle, but I made everything else. The only ingredient I missed was baking powder! The texture of the brownie is spot on with your description. BUT, I must admit these left a taste. Not like eating fake sugar, but something different. There was no lingering taste either. I wonder if It was due to the baking soda? Nonetheless, I topped them with peanut butter and popped them in the fridge. I LOVE COLD CAKES/BROWNIES. With the PB they are GREAT and masked whatever it was I was that gave me an “off ” taste! This is a great base for any brownie recipe. For a low carb recipe you can’t beat this.. Sorry I meant to say I missed putting in baking soda! What a lovely comment! You are the best follower, taking so much time to write such a lovely comment! THANKS 🙂 The ‘off’ aftertaste could be the sweetener I agree it took time to get used to sugar free crystal sweetener. That is why I added a chocolate drizzle on top actually but peanut butter is definetly a good option. I love chocolate peanut butter combo. And TRIPLE YES! to brownies in the fridge !!! I agree with you : that makes the texture even better! Thanks for trying my low carb dessert recipes! Have a great time on the blog. XOXO Carine. Hi! 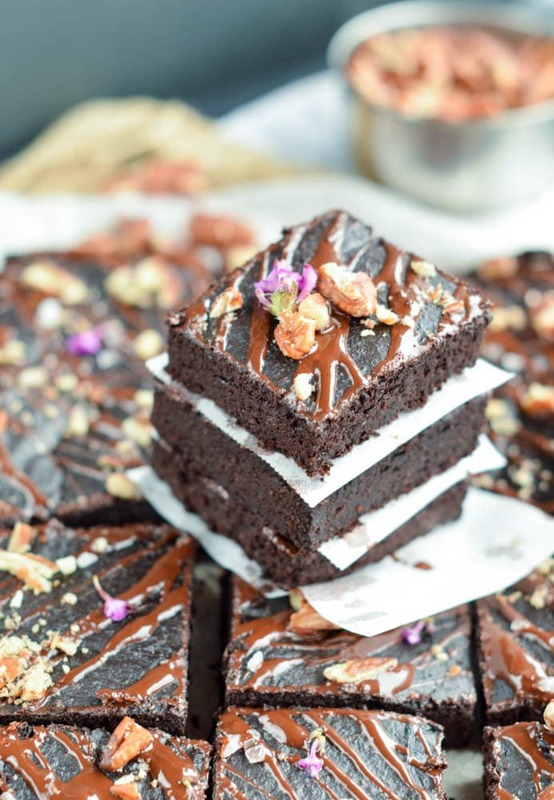 Can you send me the carb / fat / protien count for 1 slice of these brownies, please? Thanks..
Hi! Simply scroll down after the recipe card and you will see the full nutrition panel with carbs count, fat, calories and protein per serve. Thanks! Enjoy the brownies, XOXO Carine. Hi! I would love to make these for my boyfriend, he has epilepsy and is on a very restricted diet, I was wondering if I could use Stevia instead of Erythritol? And if so how much? Hello! I wouldn’t recommend stevia in this recipe. It won’t provide bulk as Erythritol or monk fruit sugar do. Both of those are very healthy natural sugar free sweetener. I hope your boyfriend can enjoy the brownie with one of those options ! I wish him a good recovery. XOXO Carine. So I am new at cooking with avocado but when you say “flesh” does that mean you are ONLY using the outside part of the avocado in this recipe? Hello! Avocado flesh refers to the avocado green part, the one you eat in your guacamole. It simply means no skin and pitted (obviously lol). Enjoy the brownie. It is very yummy ! XOXO Carine. Hello, Oat flour will raise the carbs consequently, there 10 times more carbs in oats than almond meal but the recipe will work. So roughly aim for 10 times more carbs per slice with oat flour. Enjoy the recipe. XOXO Carine. Can you make this in a blender or with a hand mixer if you don’t have a processor? Hi ! I guess a blender will work well too, what you want is to create a smooth avocado paste with no lumps to make sure the batter comes together and get smooth. Enjoy the brownie, XOXO Carine. Can I substitute the Erythritol with Pyure Stevia blend, which is Stevie & Erythritol mix. I made these last night and brought them to work. My co-workers had no clue and ate them all! They are seriously delicious and taste like a cross between regular dark chocolate brownie and a milk chocolate brownie. Soooo gooood!!! You made my day !!! I love to hear when a recipe turn out SO great. I love those avocado brownies and my kids loves them too even if they are not crazy about avocados. Amazing right? Thanks for sharing such a beautiful comment. Enjoy the blog and recipes around. XOXO Carine. I’ve just made my second batch of these and they are absolutely delicious! I had just had a couple of brownies with strawberries, blueberries and 0% Fage Total yogurt. It felt so indulgent on my low carb eating plan. I took a photo but there’s nowhere to upload it. Thank you so much for the recipe. They are so incredibly easy to make! Thanks for your lovely comment Rob! I am so HAPPY when a recipe makes my readers feel great. Upload your lovely pic on instagram and tag my account ! I will share on my live story for sure! Enjoy the low carb recipe on the blog. XOXO Carine. I made these exactly as written. They came out quite good. However, I calculated the calories based on 16 servings and it came to 136, not 62. I used the Weight Watcher website and entered each ingredient and amount individually. Hi, I am glad you loved the brownie recipe. Please note that nutrition panel is indicative. I am using a plugin calculator made by nutritionist, using ingredients sourced in New Zealand – where I live – different brand than what you may use in your country. Nutrition panel is always different based on brand specially when it come to sugar free chocolate for exemple. I was interested in trying these brownies because I have cut back on added sugars and carbs but I have been craving desserts recently, so I made these brownies with monk fruit sweetener and they were amazing! They tasted almost exactly like regular brownies and were light and fluffy which I love! I will definitely be making these again! YEAH!! I had been looking for a recipe like this for over a year. Thank You & Peace. Amazing! I am so glad you found my little blog. 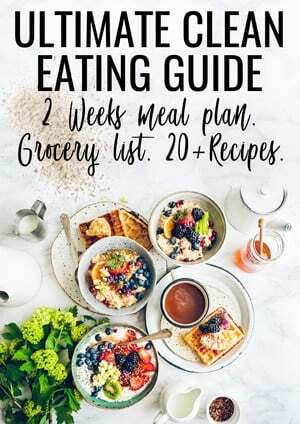 Enjoy the healthy recipes. XOXO Carine. So I believe you mean 1/4 cup, right? I made them with 45 g and they were amazing. Sorry for that mistake my dear Carolin! I always use 1/2 cup actually but you are right less is good too. It depends on how much you appreciate the avocado flavor into brownies. Some people prefer to add more sweetener to fully hide the avocado taste. I will correct the measurement right now! Thanks so much for sharing this amazing comment. I am happy to know th recipe works with less sweetener too. XOXO Carine. Can powdered erythritol be used instead of granular eruthritol in this recipe? I’d love to make it today for a friend who is diabetic! Yes of coure it should work. But the amount will vary as powdered is more dense you will need less – hard to say how much less as I never tried but try to decrease by 1/3 cup, taste the batter and adjust regarding taste before baking your brownie! Enjoy the sugar free recipes on my blog. Your diabetic friend is so lucky to have you baking lovely recipes for her. You are sweet! XOXO Carine. Hi. Just made these delicious brownies. I’m confused though. Are the carbs 6.1 total carbs per serve. As stated in the panel. So 3.7g net taking away the fiber. Or 1.7 as you state in one of the comments above. I’m going n Australia so used to having net carbs on the panels. Sorry for the confusion my friend! The nutrition panel is perfectly correct you have got 3.7 net carbs per slice. It is a typing error on y comment reply – corrected this today! Thanks for spotting this for me. Enjoy the low carb recipe on the blog. XOXO Carine. Hi Carina, these look amazing! I don’t have a convection/forced fan oven. Do I need to change the baking time or temperature to offset the lack of an oven fan? Not at all it will be fine with the same temperature and for the time, simply check your brownie every 5 minutes during the last 10 minutes of baking but should be fine with same timing. Enjoy the lovely brownie recipe and thanks for trying my recipes. Tag me on instagram with your creation, can’t wait to see your brownie !!! XOXO Carine. Can I omit the chocolate bites all together? No you can’t ! the chocolate bites are melted and it is part of the batter. The consistency will be very different if you omit this. However you can use any dark chocolate >85% cocoa or any sugar free chocolate chips you like. Enjoy the brownies. XOXO Carine. Hi! I’ve just been diagnosed with gestational diabetes so I’m desperately to find something for desserts that won’t send my sugars up. However, I’m allergic to avocado!!!!! Is there anything else you can think of that i could use? Or could I use eggs I stead of avocado and then bake the brownies???? This recipe really need some avocado but I can recommend another sugar free brownie recipe on my blog that shouldn’t spike your sugar level as it is made of coconut flour. The recipe is here. Enjoy the brownies and all the sugar free recipes on my blog. XOXO Carine. Loved them! This is the first time I made something other than guacamole from avocado. I substituted 8 packets splenda + 8 packets truvia for erythritol. I think I will add more splenda/truvia next time. Thanks for trying my recipes and for your lovely feedback. Enjoy the blog. XOXO Carine. Thank you for the lovely feeback, I am so glad you love this brwonies! Enjoy the blog. XOXO Carine. These were the perfect texture of keto brownie I’ve been searching for! I am curious tho, my batter was much thicker than the video appears. I followed the recipe exactly but wondered if too thick is an issue? Also, would it be possible to use butter instead of coconut oil in the future? I am not sure how it can be thicker if you use the same amount of ingredients, make sure you measure the amount of avocado in cups or grams for precision. Avocado differ in size a lot, here in NZ they are large that may explain why my batter is runnier than yours. It is not an issue if yours is slightly thicker the texture will simply be a bit different. Enjoy the low carb recipes on the blog, XOXO Carine. My batter also turned out thicker but I left mine in the food processor for a bit longer and added a little more coconut oil to the chocolate. I also used lankanto granulated sugar because the first time I made these I used an erythritol sweetner and it was just way too overpowering sweet chemically tasting. I may use erythritol again but will only use 1/4 cup if I do. These don’t taste like a “normal” brownie but since I’ve gone keto it is the next best thing to a brownie that I’ve found. The longer you process the thicker and dryer the brownie will be. All you need is to blend it enough to convert the avocado into a cream, that is all, not longer. I always use sugar free crystal sweetener made of blend of stevia and Monk fruit or blend of erythritol and stevia. Pure erythritol is over powering, minty and very sweet. I don’t recommend it. Enjoy the keto recipes on the blog and thanks for the lovely feedback. XOXO Carine.